Beautiful picture! Welcome to Wordless Wednesday!! It's also nice to see some more fall pictures; it is my favorite season, and though photographing in the winter can be beautiful, it does zap out some of the beautiful foliage. Wow, that is a nice shot. A great variation on the fall color thing. Thats just an amazing shot! I love the colors of autumn and how you captured the light! Wondeful image, I love those where you feel you can just walk into the picture! Happy WW to you and seasons greetings. That is so beautiful! The low sun shining into those trees is awesome! 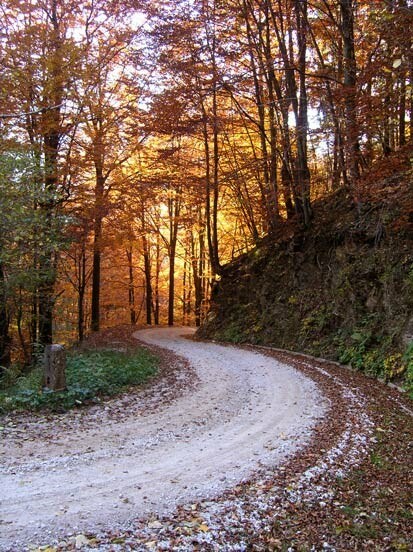 I love the curvy road...Where does the road go??? Wow!